Punxsutawney Phil saw his shadow this past Sunday morning. We all know what that means – six more weeks of winter. Less daylight, cold weather and difficulty planning winter workouts all contribute to less time on the bike. But, if you want to get better, faster and more efficient on the bike, then guess what? You got to put your time in. So what do you do? Fortunately, last year we wrote about Ways to Pedal the Winter Blues Away with four suggestions to keep motivation high: build a support structure, set up the right training environment, get some visual stimulation, and compete. Yes, you read that last one right – compete. And not later in the season – now. Yep, most of the country is under snow and cold temps but competition is still going strong. On fat bikes that is. Fat Bikes Are Big in Colorado, Wisconsin, Minnesota, Michigan, and other parts of the country. And racing fat bikes is the ultimate in beating wintertime cycling blues. Aside from racing fat bikes to keep fit, what makes a fat bike so desirable? An Ode to the Fat Bike sums it up best. So get in on the action! Stop by Peak Cycles Bicycle Shop to ride, test ride, and buy a fat bike. Grab some bike parts, gear, extra tires and you’re on your way. All you have to do now is sign up for one of the upcoming fat bike races on the Western front! 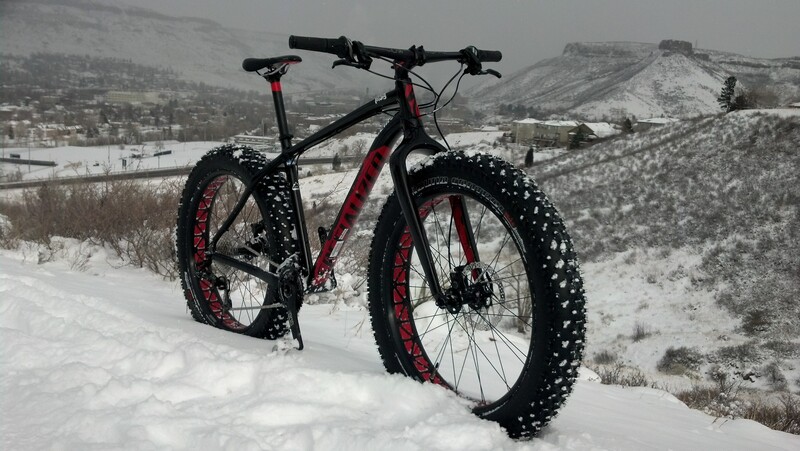 And, if you are uber competitive, check out this post on How to set up a fat bike tubeless.